For a quick access beach run just outside Carmel, look no further than Asilomar State Beach, a local favorite for a roughly two mile out and back with amazing coastal views. There is parking on the north end of the path along Sunset Drive, which runs parallel to the park’s Coast Trail. The Coastal Trail there is about 1 mile. Followed along the bluff , or drop down to the beach. 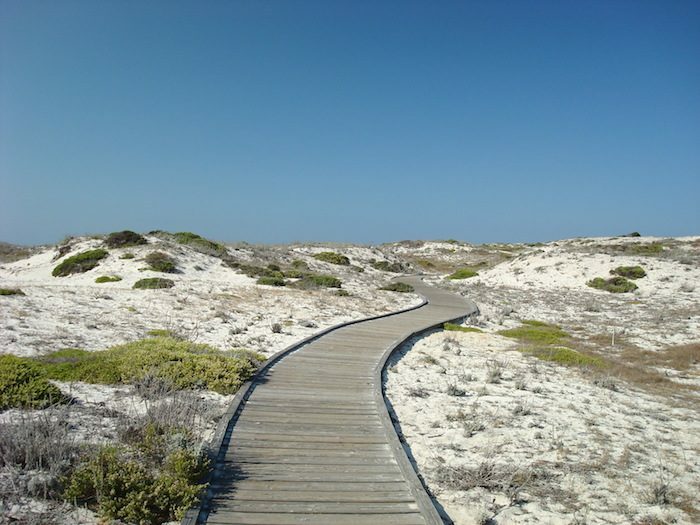 There is about a mile of good running sand there before it turns rocky near Spanish Bay, but if you feel like continuing, you can follow the boardwalk into the Natural Dunes Preserve, which is full of interesting info about the local flora and fauna. It’s a short loop, but a good turnaround point before you head back along the beach or Coast Trail to the start. Add-Ons. Wonderful add-ons in either direction, with fantastic ocean views. It’s 1.8 miles NORTH from Asilomar Beach to Lovers Point, where you can join the Monterey Bay Coastal Trail. Good shoulder/dirt path on side of road. Heading SOUTH, a sand path skirts the western edge of the golf course for 0.7 miles, joining 17 Mile Dr., which continues for many miles, around Pebble Beach, toward Carmel. It’s 1 mile to the Spanish Bay View Point, 3 miles to Bird Rock, and 4.2 miles to Cypress Point. The shoulder is narrow, but adequate.